Low Maintenenace Gardening|Gardening Tips| Santa Barbara| Ventura | Down to Earth Landscaping Inc.
We will end our Four Part series on low maintenance gardens with tips on planting. You might be aware that many factors are necessary for planting a successful low maintenance garden. These basic ingredients are the same no matter where on the planet your garden is located. The planting wisdom we are about to share below is universally accepted. However, there are distinctions specific to Santa Barbara landscaping. We are uniquely qualified to share some of what we have discovered about planting in Santa Barbara County during our 42 years of experience here. Hardiness generally refers to plants that survive and thrive in climates of extreme weather, such as dry heat over 100 degrees Fahrenheit or freezing temperatures. There are areas of Santa Barbara and Ventura counties, such as Santa Ynez and Ojai that have these extremes of climate. There are many types of plants that require these types of weather in order to perform their best. This includes, but is not limited to, lilacs, tulips, peonies, and cherries. Hardiness, therefore, means something a bit different in here than in other climates. Santa Barbara’s temperate climate prevents these plant materials that need the freezing temperatures and heat of Santa Ynez and Ojai from blooming or fruiting. Does this mean that Santa Barbara or Ventura city landscapes cannot include these types of plants? No! However, mean that in order to make them successful, they may require time in a freezer before planting. Learn the needs of the plants to prepare for success! It is imperative that you discover the kind of soil located on your property. Many property owners are unaware that as real estate is developed good topsoil can be scraped away, leaving barren soil for the new owner. In order to plant a low maintenance garden, soil amendment is key. See our previous blog on soil amendment for tips. Ironically, the sandy loam of the downtown area is the best soil in the Santa Barbara area. This is because those downtown areas were once home to many olive, lemon and avocado orchards. Those of you lucky ones who live in the downtown area may have less work to do when preparing soil for low maintenance planting. The chemistry of soil is central to plant material success. Know the soil chemistry you possess before you fall in love with a plant that may not perform well without specific soil amendment. When planting a garden to be low maintenance, one must consider how much light the plant material will need. This will cut down on water costs and fertilization. If the plants receive this kind of thought, they are less apt to be stressed and more likely to bloom beautifully the whole season long. Here in Santa Barbara, the most important light level distinctions are connected to micro-climate. Plants that are closer to the beach are likely to get less sunlight as the marine layer intensifies, particularly in the month of June. Choose plant material accordingly. Nurseries are helpful here. Plant materials often come from the nursery with notations regarding the sunlight needs of the plant. Pay attention and design garden beds according to these notes. Santa Barbara is naturally considered desert. Precious few of the iconic Santa Barbara plant materials such as Bouganvillea, Eucalyptus, and Jasmine, to name a few, are native. Santa Barbara’s average yearly rainfall is low at approximately fifteen inches. In order to plant a low maintenance garden, it is important to know what will thrive in this environment. 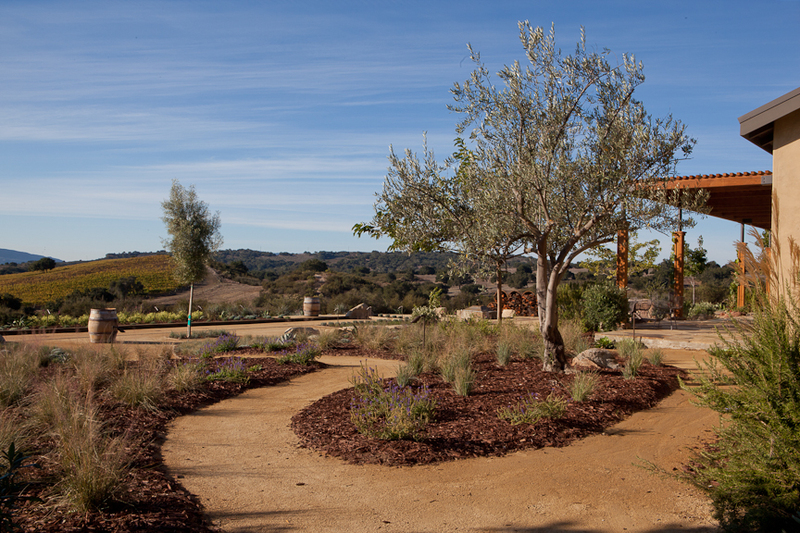 We use “waterwise” plant material and “Xeriscape landscaping” principles. Xeriscaping refers to landscaping and gardening in ways that reduce or eliminate the need for supplemental water from irrigation. It is promoted in areas that do not have assessable, plentiful or reliable supplies of water. These guidelines promote the idea of water conservation and they surprisingly support endless variety of flower and foliar color and texture that are just as exciting as water-thirsty plant varieties. There are additional reasons to consider water thrifty plants. Many such as sage and Lavender have oils that saturate the air with their fragrance. They are nature’s aromatherapy also encourage birds, butterflies, and beneficial insects. There are three common methods of pruning plants that are important to consider when choosing plant materials for low maintenance gardens. •	Dividing: The separation of plants, physically, with a sharp shovel or trowel with the root system in tack. This is part of transplanting. Think of it as a hair cut for plant material. It is necessary for plants like Ginger to thrive. •	Staking: The practice of driving a wood or metal stake into the ground behind tree or shrub to act as a brace. Staking provides structural support for delicate plant material. •	Deadheading: To pull dead or dying flowers off a plant. Deadheading encourages new blooms by removing the old growth and allocating a plant’s resources toward reproduction. It also prevents annuals from producing seeds and dying. Low maintenance plant material should require little pruning, or at least can bloom for longer without constant care. But because Santa Barbara is such a temperate locale, plants will bloom throughout the year and therefore, need pruning more often. This characteristic of Santa Barbara’s climate often requires pruning during different times of the year than many other parts of California. Keeping up on daily “deadheading” of the flowers can save time in the long run. Five minutes a day feels less daunting than two hours on a Saturday. Consider the plant’s bloom period— and are they attractive after the bloom period? Some shrubs remain beautiful all season long. Rosemary, for example, grows and blooms all summer, providing herbaceous goodness and beauty with little work. See our website’s plant guide for further information on of drought tolerant and low maintenance native plant materials. Of course, we specialize in all of these maintenance duties, and would be happy to offer our gardening expertise. Call today for an estimate!